"There are somewhere between one and five million victims of a dog biting someone per year in the United States alone each year, depending on the source your dog attack statistics come from. There are millions of homes that have dogs as pets, and by some estimates, half of all dog bites are caused by pets from known or recognized dogs." Bites and nips make most of these cases, and only about 15% to 20% become infected, but that is still a sizable number. When you get bitten, several things can be done right away to minimize the seriousness, and reduce the possibility of infection. When you are the victim of a dog bite the first thing you should do is to thoroughly wash the area with generous amounts of water, using preferably an antibacterial soap. The dog bite can carry one or more of some really bad bacteria, including staph and strep. Some studies suggest between 20 and 30 different germs that can be carried in a dogs saliva. After the area is thoroughly cleaned, pat the wound dry, and apply several drops of tea tree oil three times a day for several days, and then continue once a day until it is fully healed. Dog bites are notorious for becoming infected, so close observation is recommended. When someone is bitten, dog health is important. If you suspect or don’t know if the dog has rabies, get medical attention immediately, as rabies is very serious. Also keep an eye on the wound and check for any signs that it might be infected, including increased redness, swelling, fever and or chills. This might require antibiotics, but as always, check with your doctor. Most dogs are friendly, and cause no threat to humans, but there are some dangerous dog breeds that seem to have a higher incidence of biting. 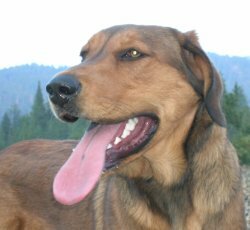 A canine bite is most likely to come from Pit Bull breeds, wolf mixes, a rottweiler attack, huskies, and German shepherds are among the list. There are different opinions on the most aggressive dog breed, and the list above is by no means a complete list. When choosing a dog for a family pet, among the friendlier or family type dogs are Labradors, setters, Dalmatians, boxers, and Spaniels. No matter what type of dog you have, or that you have in your neighborhood, there are a few things you can do to minimize the risk of becoming a dog attack victim. Be familiar with dog behavior, particularly children and dogs. Educate your children not to run or scream around dogs, because they are attracted to movement.